Trailing stop losses can give you a way to limit losses and to lock in profits on your trades. A trailing stop works so that as a trade moves into profit, the stop level adjusts to lock in the profit and limit the loss potential. In this way the downside is limited by the stop level but the upside is potentially unlimited. Put another way, trailing stops are a way to allow your profitable trades to run and losses to be limited. In this article I describe how trailing stops work. I also test evidence that trailing stops lower risk and result in higher profits. This is done by running back tests on two basic strategies both with and without trailing stops. 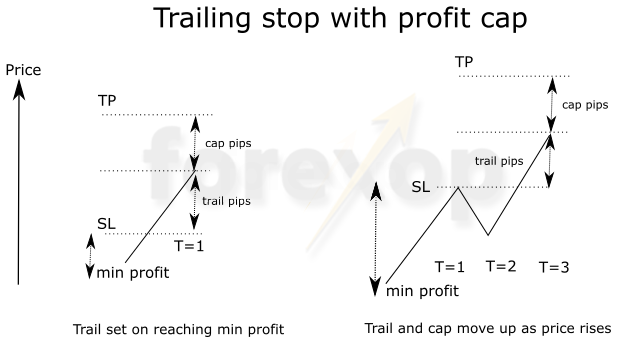 There are several variations of the trailing stop used by forex traders. Some of these are offered as standard on trading platforms, others need to be custom-coded with software. The most common trailing stop systems are described here. With the standard trailing stop the trader sets an activation profit threshold. Once the threshold is reached the trailing stop “kicks in”. The system places a stop loss just below (or above for a short) the current market price. Unlike a regular stop loss the trailing stop will move as the price reaches new highs and the profit on the trade increases. 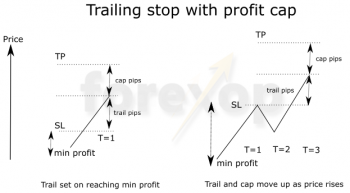 With a buy-side position the trailing stop will only move upwards – increasing the profit. The reverse is true for a sell-side position. The trailing stop will stay fixed if the price moves against the trade. The exit happens once the stop level is hit. The diagram above illustrates a standard trailing stop system. With this type of trailing stop the trader will need to set a trail distance. The trail is the “distance” between the current market price and trailing stop exit point. So for example with a trail of 10 pips the trailing stop will float 10-pips below the market’s highest price since “kick-in”. With some trading systems the trail point is allowed to move either dynamically or in fixed increments (step sizes either in time or price). With a dynamic trailing stop the placement of the stop can move on every price tick. Whereas with an incremental trailing stop the level is only changed once the price changes by more than the step size. Dynamic trailing stops have a high overhead on your trading software and on your broker who has to processes the rapid order throughput. With an incremental trailing stop the level is only changed once the price changes by more than the pre-set step size. With a time-based increment the level is changed only once per interval. With a standard trailing stop the take profit level is usually left unset or at least set very wide so that the profits can run. This way the trade will usually exit when the stop loss is hit rather than when the take profit is hit. For this reason some traders prefer to use a variation on this known as the capped trailing stop. With the “capped stop” the take profit level is also set dynamically. The cap is placed a small distance above (below for sell orders) the market price. The cap is held fixed for a certain period of time or price interval. If the cap or stop isn’t reached in that time interval the trade remains open. Clearly both the cap and stop can’t be adjusted on every tick otherwise neither would ever be reached. The benefit of this approach is that it can result in higher profits. The reason being that there’s a probability greater than zero that the take profit level will be reached. Remember that without the cap the trade will nearly always exit only through the stop loss which is set “beneath” the triggering price level. When you use a trailing stop you “trade off” a portion of your profit in order to limit your losses. When you set a trailing stop there is always the chance that the market will not move further in the direction of your trade. In this case the stop will be triggered at or below your current profit level. Trailing stops work best when the market is moving in the direction of profit. For this reason sometimes it’s better to use what’s called a conditional trailing stop. With this method the trailing stop only triggers when a certain condition is met. Otherwise the standard stop and take profit is kept. The “condition” is usually based on the market direction. Momentum based conditions are the most common. With these, the trailing stop activates at a point in time when both the minimum profit level is reached and when the market is moving in the direction of profit. A basic condition for example can be on price change over a certain number of bars. For example, if the price moves more than +10 pips over 2 bars, the trailing stop activates. The reason this is used is that when the momentum is in the direction of the trade it’s more likely that the stop level will have a chance to move upwards within the next few bars. But if the momentum is moving against the trade, there’s a higher chance that the trailing stop will be hit quickly before having a chance to move upwards (downwards) and reach a better profit. In this case taking the profit immediately is usually the best course rather than applying the trailing stop. One thing to be aware of when using trailing stops is the difference between broker side and client side stops. With a broker-side system the trailing stops are managed as part of the trade order. Once the order is placed and the trailing stop is set, the broker’s trading software will monitor the trade and set the stop accordingly as the market moves. Client-side trailing stops are executed by the trader’s software. Metatrader for example has a basic trailing stop function as do other trading systems. Client side stops will only work while the client terminal is open whereas broker side stops are set for the lifetime of the trade. This means when using client-side stops you’ll need to keep your trading terminal open for them to work. We back tested the trailing stop systems on two “vanilla” strategies. The first was a trend follower, and the second a breakout system. The tests were run over two durations namely short term (12 months) and long term (10 years). Adding both the cap and the condition gave better returns than using a regular trailing stop alone. This came at the expense of slightly higher drawdown. 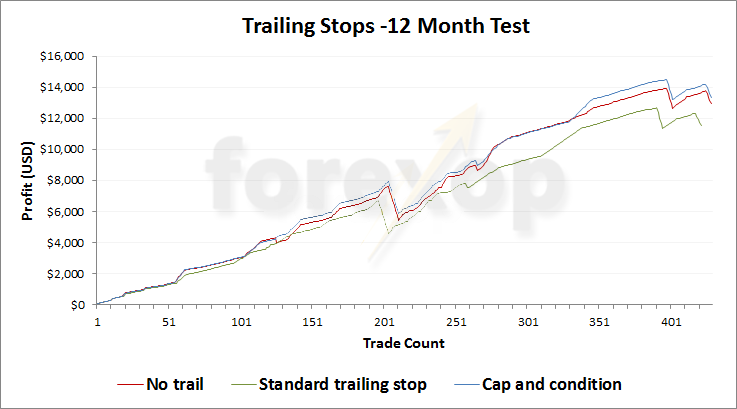 In the 12-month tests, the trailing stop with cap and condition performed better than using either a trailing stop or using no trailing stops. The strategy with “cap and condition” achieved a profit of $12,524 with drawdown of 2.71%. With standard trailing stops the total profit was $11,281 with a drawdown of 2.63%. Using fixed ratio profit/stop losses achieved a profit of $12,191 with 2.67% drawdown. 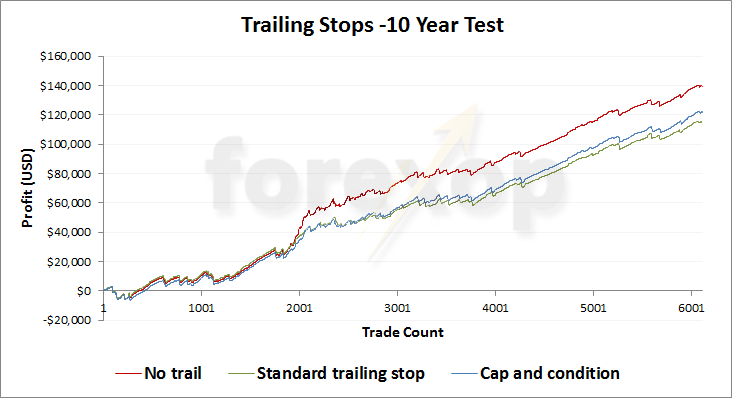 Over longer timeframes both the trailing stop and modified trailing stop (with cap and condition) significantly underperformed the strategies using no trailing stops. Adding the trailing stop allows profits to run and this did result in a few big winners. The most profitable trade for the standard trailing stop was $372.02. The most profitable trade with cap and condition was $402.5. However over time this benefit was negated by a lower per trade (average) profit. This is because a trailing stop system has to “give up” a portion of profit in return for a limited loss. We tested multiple configurations and the trailing stop systems always resulted in lower profits over the longer time periods. What’s also surprising is that adding the trailing stops didn’t reduce drawdown to any significant level. On the longer test the standard trailing stop reduced drawdown by just 0.18%. But this came at the expense of a 22% drop in profits. The trailing stop with cap and condition increased drawdown slightly by 0.03% but resulted in a 15% reduction in profits. We also expected the trailing stop to work better with the trend follower as this is its natural territory. But the results were virtually the same with both strategies. With the standard trailing stop the trail point was set a certain distance below (or above for short) the current price level. The trail point was initiated as soon as the profit reached 0.3% – (averages 45 pips on GBP/USD or 35 pips on EUR/USD). The trail point was adjusted only once per interval (5-minute period). With the “non-trailing stop” strategy we used a fixed stop loss/take profit with these points being set at +/-0.9% and +/-0.3% respectively. This system added a profit cap above (below for shorts) the current price level. The trail level and cap was re-adjusted just once per time interval (5-minute bar). The trade exited if either the profit point or the trailing stop point was reached during the interval. This modifies the standard trailing stop system (above) where the trade will only exit when the stop loss is reached. The trailing stop with cap (described above) was modified further to add a momentum parameter. 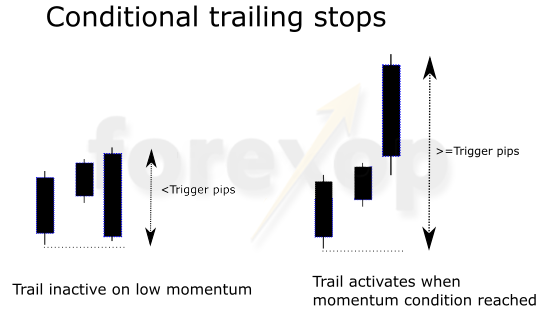 The conditional trailing stop only activated if a momentum condition was reached. The condition was that the price distance between the previous two intervals (5-minute bars) was greater (or less for shorts) than the trigger level. For example with a 10 pip trigger the price needed to move at least 10 pips (up or down depending on trade side) between the previous two bars. In the longer duration tests we ran the strategies over a ten-year time frame. The results below summarize the highest achieved profits using the standard trailing stop and modified trailing stop system. The standard trailing stop resulted in a 22% fall in profits compared to using a fixed ratio stop loss/take profit system. The modified trailing stop approach (cap and condition) resulted in a 15% fall in profits over using the unmodified strategy. On the longer tests neither the standard nor the modified trailing stop system reduced drawdown to any significant level. This was the accumulative effect of the running profits being lower compared to the vanilla strategy. Are Trailing Stops Worth Using? Trailing stops with caps outperform the standard trailing stop system. Adding the “condition” improved the performance of both systems. The performance gain of the two trailing stop systems comes at the expense of slightly higher drawdown. However given the large profit differential the trade-off seems worth it. In the shorter back tests (one year or less) using a trailing stop with cap outperformed a fixed ratio stop loss/take profit system. In longer duration tests all of the trailing stop systems significantly underperformed a fixed ratio stop loss/take profit system. The profit reductions we observed were between 15% but also up to as much as 30%. Over the longer duration (10 year tests) none of trailing stop systems reduced drawdown to any significant level. The key point to note about trailing stops is that “locking in a minimum profit” always comes at the expense of a slight reduction in profit on each trade. It is true that letting profits run, as trailing stops do, increases the odds of a few big wins. But over the long term the lower profit average on each trade becomes significant. This cumulative effect is most noticeable with high frequency trading strategies. So are trailing stops worth using? There may be other strategies that work better with trailing stops. For example where the trailing stop results in trades being held open much longer and as such this could lower trading costs. This hasn’t been tested here. There may also be the case for using them for manual trades where discretionary input of the trader is available. Without a much wider trailing stop I don’t think we got a full picture here, both examples used were fairly tight trailing stops which is slightly at odds with how we see them used by professionals. Trying to reduce drawdown and increase profits is a bit of a conflict in my opinion, you’re either trying to increase profits and accepting higher drawdowns or vice versa, never the same. Can you name one or more brokers or platforms that offer automated Trailing Stops with cap? This is enlightening. Standout research. I had similar thoughts a while ago when considering the merits of a system that exits using predefined take-profit levels, (considered as a % of gain) vs. one that exits on predefined conditions, using indicators. The t/p cuts profits short but reduces drawdowns. The indicators I’m using allow larger retracements. Psychologically, I prefer using the t/p levels, but that might not be rational. My short-term testing is probably insufficient and I’ll have to learn how to do a long-term historical backtest. Excellent, well presented article, Steve. I’m new to fx and the trailing stop with no take profit seemed to fulfil the mentra “cut the losses and let the profits run”. However in practice as you suggest it’s quite an art form not to be stopped out early in a volatile market. However this article is timely for me. I’m writing an ea to manage and close my trades, in case I’m unable to get to my computer over a few days. I’m a professional software programmer in my other life and so this is relatively straightforward to do. I’m playing around with risk and profitability criteria to change s/l settings as well as closing trades, like before NY close. The big deal though is the ability to have separate rules for individual trades. So I developed a “small ruleset” that uses the order comment to overrule the ea settings. However that’s all by-the-by. Thanks for a great and timely article. Thanks steve! This post confirms what I thought all along that trailing stops are not all they are cracked up to be. I was one of those taught to use them right from the start and that they are a good way to keep losses under control – I was in fact encouraged by my broker to use them. but from trial and error and a bit of testing I found that they were not doing much for my bottom line but in fact cutting off trades that would have made a bigger proft. Use them but dont overuse them is my advice.